Do credit unions and banks seem about the same to you? In many ways, they are. After all, most credit unions and banks offer similar products and services. The application process can be about the same and access to the institutions – online and at physical locations – is also similar. 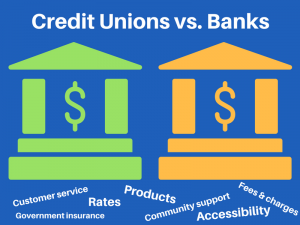 But there are significant differences between credit unions and banks. The big difference is that banks are typically investor-owned and for-profit. Credit unions are controlled and owned by their members. Another major difference is that credit unions return profits to members in the form of lower interest rates, smaller fees, and more. Banks pay their profits out to shareholders. Credit unions are not-for-profit financial entities that are wholly owned by their members. They take in deposits, provide financial services, and function similar to a bank. But they’re not federally taxed like banks, and they’re completely managed and funded by credit union members. Each individual credit union member is an owner in equal part of the institution. You must hold a minimum number of membership shares of the credit union upon joining, typically for a nominal deposit of somewhere between $5 and $30. Credit unions have board members who are elected by members in a democratic process. This ensures each member’s voice is heard. Board members voluntarily govern the credit union and work toward making decisions that benefit all members. The result is a cooperative structure with a strong framework to help them accomplish their financial goals. For example, member deposits can be loaned out to another member as a home loan, providing the borrower with financial flexibility and a good return to the depositor and the credit union. The National Credit Union Share Insurance Fund (NCUSIF) insures federal credit unions. An independent agency called the National Credit Union Administration (NCUA) administers the NCUSIF. This gives federal credit unions the same insurance as banks through the FDIC (Federal Deposit Insurance Corporation). Like FDIC-insured bank deposits, NCUSIF insurance covers up to $250,000 on deposits to federal credit union accounts. Look for official NCUA signage. Federal credit unions must display signs indicating they’re NCUA-insured at all branches. You should see signs near each teller station and anywhere members are expected to make deposits. Go to the website. NCUA signage must also be present on the website of every federal credit union, as well as wherever it offers an option for opening an account. Check the name. Only federal credit unions may use the word “federal” in their name. Click here to find a federal credit union near you. Many would argue that banking is all about getting the best rates. Before we get into the rates comparison, just remember that rates should only one of the factors considered when comparing banking options. Generally, credit unions are known to offer lower loan rates and higher savings rates. This is good for anyone who deposits money or borrows money. Higher savings rates lead to faster financial growth opportunity. Lower loan rates lead to money paid over the life of loans. Note: Savings and loans rates aside, credit unions help you save money in other areas. In comparison to large financial institutions, credit unions also charge less in fees, require lower minimum account balances and give better rates on credit cards. Build that nest egg—View current deposit rates! Make your money go further—View current loan rates! *Partners Financial FCU rates are even lower! Not enough of a difference in rates to make the switch to a credit union for your savings and lending needs? If you have less than stellar credit but need a loan, credit unions can often work with members. If you’re thinking about applying for a credit card, credit unions charge less in fees, offer no interest on balance transfers and provide additional incentives. Start making smarter financial decisions today! At Partners Financial FCU, we’re here to help you achieve your goals. To learn more about our savings and lending products, or to find out how to join Partners Financial, contact us today at 804-649-2957.